"Lienchiang County" redirects here. For the county of the People's Republic of China, see Lianjiang County. The Matsu Islands (Chinese: 馬祖列島; pinyin: Mǎzǔ Lièdǎo; Fuzhou dialect: Mā-cū liĕk-dō̤ or less frequently, Chinese: 馬祖群島; pinyin: Mǎzǔ Qúndǎo; Fuzhou dialect: 馬祖島 Mā-cū dō̤) are a minor archipelago of 36 islands and islets in the East China Sea administered as Lienchiang County (Chinese: 連江縣; pinyin: Liánjiāng Xiàn; Fuzhou dialect: Lièng-gŏng gâing) under streamlined Fujian Province, Republic of China (Taiwan). It is the smallest county in the ROC free area. Only a small area of what is historically Lienchiang County is under the control of the ROC. The People's Republic of China (PRC) administers the part of the historical county on mainland China as Lianjiang County, which claims the entire archipelago to be its Mazu Township (馬祖鄉; Mǎzǔ Xiāng; Mā-cū hiŏng). 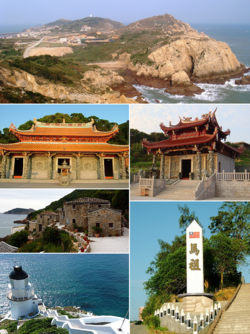 The ROC also controls two other archipelagos along the coast of Fujian, namely the Kinmen Islands and the Wuqiu Islands, which together make up Kinmen County. The Lienchiang name is derived from the original Lianjiang County of Fujian province in Mainland China. In April 2003, the county government started considering changing the name to Matsu County to avoid confusion with the county of the same name on the mainland. Some local people opposed the name change because they felt it reflected the pro-independence viewpoint of the Democratic Progressive Party. Mainlanders from Fujian and Zhejiang started migrating to the islands during the Yuan Dynasty. 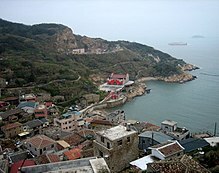 Most of the people on Matsu came from Houguan (侯官) (today Changle, Fujian). The popular net fishing industry had established the base for development of Fuao settlement and industrial development of the region over several hundred years. Some crewmen of Zheng He temporarily stayed on the islands. During the early Qing Dynasty, pirates gathered here and the residents left temporarily. In contrast with Taiwan and Penghu, the Matsu Islands were not ceded to the Japanese Empire via the Treaty of Shimonoseki in 1895. Neither were they occupied by Japanese troops during World War II because they were not important militarily. Due to its strategic location for the only route for spice road, the British established the Dongyong Lighthouse in Dongyin Island in 1912 to facilitate ships navigation. In 1911, the Qing Dynasty was toppled after the Xinhai Revolution on 10 October 1911 and the Republic of China (ROC) was established on 1 January 1912. Matsu Islands was subsequently governed under the administration of Fukien Province of the ROC. On 1 August 1927, the Nanchang Uprising broke out between the ruling Nationalist Party of China (KMT) and Communist Party of China (CPC) which marked the beginning of Chinese Civil War. After years of war, the CPC finally managed to take over mainland China from KMT and established the People's Republic of China (PRC) on 1 October 1949 which also covers the Lianjiang County of Fujian. The KMT subsequently retreated from mainland China to Taiwan in end of 1949. After their retreat, the KMT retained the offshore part from the original Lianjiang County located on Matsu Islands, and also all of Kinmen County. In July 1958 the PRC began massing forces opposite the two islands and began bombarding them on 23 August, triggering the Second Taiwan Strait Crisis. On 4 September 1958, the PRC announced the extension of its territorial waters by 20 kilometres (12 mi) to include the two islands. However, after talks were held between the USA and PRC in Warsaw, Poland later that month, a ceasefire was agreed and the status quo reaffirmed. The phrase "Quemoy and Matsu" became part of American political language in the 1960 U.S. presidential election. During the debates, both candidates, Vice-President Richard Nixon and Senator John F. Kennedy, pledged to use American forces if necessary to protect Taiwan from invasion by the PRC, which the United States did not recognize as a legitimate government. But the two candidates had different opinions about whether to use American forces to protect Taiwan's forward positions, Quemoy and Matsu, also. In fact, Senator Kennedy stated that these islands - as little as 9 kilometres (5.5 mi) off the coast of China and as much as 170 kilometres (106 mi) from Taiwan - were strategically indefensible and were not essential to the defense of Taiwan. On the contrary, Vice-President Nixon maintained that since Quemoy and Matsu were in the "area of freedom," they should not be surrendered to the Communists as a matter of "principle." Self governance of the county resumed in 1992 after the normalization of the political warfare with the mainland and the abolishment of Battle Field Administration on 7 November 1992. Afterwards, the local constructions progressed tremendously. In 1999, the islands were designated under Matsu National Scenic Area Administration. In January 2001, direct cargo and passenger shipping started between Matsu and Fujian Province of the PRC. Since 1 January 2015, tourists from mainland China could directly apply the Exit and Entry Permit upon arrival in Matsu Islands. This privilege also applies to Penghu and Kinmen as means to boost tourism in the outlying islands of Taiwan. The Matsu Islands comprise 19 islands and islets, which include five major islands, which are Nangan, Dongju and Xiju (both in Juguang Township), Beigan and Dongyin. Minor islands include Liang (亮島), Gaodeng (高登), Daqiu (大坵) and Xiaoqiu (小坵), which are all belong to the Beigan Township. Dongyin is the northernmost and Dongjyu is the southernmost. Dongyin is 100 nautical miles (190 km) from Keelung, Taiwan, 180 to the Penghu islands, and slightly over 10 nautical miles (19 km) from the Chinese Mainland. The soil is not ideal for farming. The highest point is on Beigan, 298 metres. Average annual temperature is 18.6 °C, with the average low being at 13 °C and average high at 29 °C. The daily temperature varies greatly during day and night. The region experiences subtropical maritime climate, which is influenced by monsoon and ocean currents and its geographic location. Matsu has four seasons, where during winter it is cold and wet, during summer and spring it is foggy and during autumn the weather is generally stable. Matsu Islands is administered as Lienchiang County under the Fujian Provincial Government. 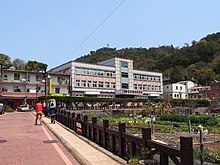 Nangan Township is the county seat which houses the Lienchiang County Government and Lienchiang County Council. The county is headed by a magistrate which is elected every four years in the ROC local elections. The incumbent magistrate is Liu Cheng-ying of Kuomintang. Lienchiang County is divided into 4 rural townships. It is further divided into 22 villages and 137 neighborhoods (鄰). Lienchiang County is the only county in Taiwan which doesn't have any city or urban township. All townships, except Juguang, are named after the largest island in its jurisdictional area, but most townships also include other islets. 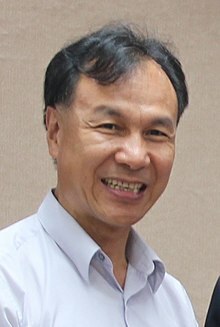 Lienchang County voted one Kuomintang legislator out of one seat to be in the Legislative Yuan during the 2016 Republic of China legislative election. Since March 2019, the Lienchiang Cross-Strait Matters Forum started as an official forum between Lianchiang County of the Republic of China and Lianjiang County of the People's Republic of China to discuss matters regarding the two sides. The majority of native Matsu Islands residents originated from Northern Fujian. Several of the islands of Matsu are not inhabited permanently. Some of these are garrisoned by soldiers from the Republic of China Armed Forces stationed in the county since the end of Chinese Civil War in 1949 and during the First and Second Taiwan Strait Crisis in 1954 and 1958 respectively. Due to that high military demand, mass stationed military personnel had created unprecedented population growth in the county where the population reached its peak in 1971 with a total of 17,088 people. After those intense period, the population decreased year after year due to the sluggish industries which created mass youth outflow due to lack of employment opportunities. In recent years, the population in the county has gradually increased back because of immigration and become stable due to the improved transportation between Taiwan Island and Matsu Islands as well as mass construction projects. Mandarin Chinese is the official language of Lienchiang County. The native language spoken by Matsu residents is Matsu dialect, a subdialect of Fuzhou dialect. Chen (陳) is the most common surname, then Lin (林), Wang (王), Tsao (曹) and Liu (劉). Matsu, though named after the goddess Matsu, is written with a different character that has a different tone. But the Matsu Islands are not the birthplace of the goddess as the human Lin Muoniang - Meizhou Island is — but her death place (on a seaport named after her on Nangan Island). The Matsu Nangan Tianhou Temple (馬祖南竿天后宮), a temple dedicated to the goddess, contains the sarcophagus of Lin Muoniang. It is, however, not as popular as the Meizhou temple. Most Taiwanese pilgrims to Meizhou start off their journey in the Matsu Islands because they are the closest ROC-controlled territory to Meizhou, which is controlled by the PRC. Due to its geographically remote location, the manufacturing business of Matsu has never been fully developed. Among them, the wine making industry of Matsu Distillery is the most distinguished feature. Tourism and service businesses are still not prominent. However, most of its commercial tradings focus on retail businesses and restaurants for stationed military consumption. Farm products of Matsu include rice, sugar cane, tea plant, orange. Sea animals, such as fish, clams, and jellyfish, are also popular exports due to its nature as the major traditional industry in Matsu. However, the flourish of fishing ground is almost exhausted by arbitrary fish bombing by Mainland China fishing boats, while the population of fishes is decreasing as well. In July 2012, Matsu residents voted in favor for the establishment of casinos, which led the path of the prospect gaming industries in the county and the passing on of Gaming Act (Chinese: 觀光賭場管理條例). The islands are powered up by their fuel-fired (diesel) Zhushan Power Plant located in Cingshuei Village of Nangan Township with a capacity of 15.4 MW commissioned on 22 March 2010. The other power plant is Xiju Power Plant in Xiju Island of Juguang Township. Generally, the environment of Matsu Islands is still good. The major source of pollution is from family and military households waste. There are however concerns that the continued lack of modern sewage facilities results in household waste seeping into groundwater. One of the most promising resources for local economy is tourism. Lienchiang County Government is making an effort to attract more visitors to the Matsu Islands, especially among foreigners. Nangan is the capital of Matsu and it is noted for its granite tunnel and the Iron Fort. It has two interconnected main roads. The Beihai Tunnels are manmade granite tunnels. Both tunnels were remarkable for their time, and they took great effort to construct. The tunnel in Nangan was built in 1968. The completion of Beihai Tunnel took the effort of thousands of men. The 700 metre tunnel has a width of 10 metres and a height of 16 metres. It was completed in 820 days with shovels, spades and explosives; the tunnel also took the life of a platoon of soldiers. The tunnel was considered a military location and was not opened to the public until 1990. The Iron Fort is located on the Southwest side of Nangan island. Located by a small cliff, it is a vulnerable spot for outside attacks or illegal smuggling of materials. With that in mind, the fort was built for defence. It is equipped with multiple machinegun rooms and rudimentary living facilities. It is now open to the public, and although most of the equipment has been removed from the site, the site itself brings back a vivid image of what it was like for soldiers at that time. Museums in Matsu including the Matsu Folk Culture Museum, Ching-Kuo Memorial Hall and War and Peace Memorial Park Exhibition Center. Since 1990, the county controls the Matsu Islands Bird Sanctuary [zh], which spreads across eight islands and islets in Nangan, Beigan and Tongyin Townships. It contains 30 species in 15 orders, mostly gulls and terns. In 2000, four pairs of the critically endangered Chinese crested tern, previously thought to be extinct, were discovered nesting on the Matsu Islands, giving them global conservation importance. There are also mosses and ferns rare or absent elsewhere in the ROC. Cetacean species that have become rare along Chinese coasts are still present here such as false killer whales and finless porpoises, providing opportunistic observations at times. Finless porpoises in this areas are generally smaller than other subspecies, and it is unique that two subspecies inhabit in this region where Matsu region is the northern limit for one of these. Both Nangan and Beigan have airports which are the Matsu Nangan Airport and Matsu Beigan Airport respectively. Dongyin and Juguang (in Xiju Island) house heliports which only operates during winter time and priority is given to local residents to travel to Nangan. Due to the fact that the main airport is located in Nangan, boats are the main form of transportation between the islands in the county. There are two ferry rides to Mainland China. One arrives at Mawei District of Fuzhou and departs from Fuao Harbor at Nangan Township in which the journey normally takes 90 minutes while in Nangan. Another arrives at Huangqi (黄岐镇) of Lianjiang and departs from Beigan Township in which the journey takes only 20 minutes. Due to their size, travelling by motorized scooter is an ideal way to get around the main islands such as Nangan and Beigan. Both Islands have regular buses and taxis are also economical. ^ Sandy Huang (April 6, 2003). "Cases of mistaken identity perplexing Lienchiang County". Taipei Times. Retrieved January 14, 2009. ^ Norris, Robert B. (November 29, 2010). "Quemoy and Matsu: a historical footnote revisited". American Diplomacy. Retrieved 2014-04-01. ^ "Lienchiang County Council - Introduction to Matsu". mtcc.gov.tw. ^ a b "The Matsu Islands". ^ "Climate, Flora and Fauna - Matsu National Scenic Area". ^ Feng, Shao-fu; Lim, Emerson (6 March 2019). "Lienchiang Cross-Strait Matters Forum focuses on sea transportation". Focus Taiwan. Retrieved 7 March 2019. ^ "History and customs". Matsu National Scenic Area. Retrieved February 8, 2011. ^ "Matsu votes to allow building of casino". ^ "Matsu Island opens doors to tourists". Taiwan Today. March 3, 2010. Retrieved February 8, 2011. ^ "Matsu islands aim to attract more overseas tourists". Taipei Times. August 29, 2010. Retrieved February 8, 2011. ^ "Climate, Flora and fauna". Matsu National Scenic Area. Retrieved February 8, 2011. ^ "A natural aquatic menagerie". Lienchiang County Government. Retrieved 2015-01-03. ^ 海洋生态宝库. The Midwest News. 2014. Retrieved 2015-10-13. ^ "Island to Island Transport - Matsu National Scenic Area". ^ "Three Mini-Links - Matsu National Scenic Area". Wikimedia Commons has media related to Lienchiang County.